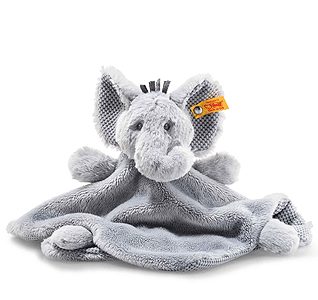 Steiff Ellie Elephant Comforter is hand made in the finest grey cuddly soft plush and carries the Steiff trademark, Stainless steel Steiff Button in Ear and yellow ear tag. The Soft Cuddly Friends Ellie elephant comforter promotes visual and haptic stimulation. She measures 26 cm and has a soft and cuddly head with lovingly embroidered grey eyes. The comforter is made of two different material thicknesses. The thinner interior cloth and inner ears are made of a soft material mix. The soft exterior of the comforter has been intentionally made of a firmer material mix. Her head is made of soft and cuddly plush fabric for your baby's soft skin.